One of the most serious and life-altering injuries a victim can suffer is one that causes quadriplegia. Quadriplegia, also called tetraplegia, is a specific type of paralysis that causes the victim to lose movement in both the arms and the legs. Paralysis is defined as the loss of ability to use a muscle or a group of muscles. When a victim loses the ability to use both the arms and the legs, bodily functions are typically affected as well. Quadriplegia is not actually caused by an injury to the arm and leg muscles themselves but by an injury to the spinal cord. The spinal cord runs from the brain down the spinal column, carrying inside it nerves that work as messenger routes throughout the body. The brain sends messages through the nerves to tell the body what to do, such as walk, bend or pick something up. Messages are sent back to the brain through the spinal cord. For instance, if you step on something sharp, the nerves that run from your foot back to your spinal cord will send a message to your brain and your brain will react accordingly. When severe damage occurs to the nerves that send those messages, tetraplegia (more commonly referred to as quadriplegia) can occur. 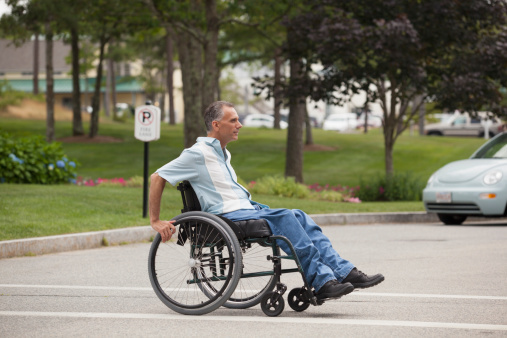 Spinal cord injury – The most common causes of quadriplegia involve a spinal cord injury. When the spinal cord is damaged, the messages that it transmits to and from the brain can no longer be delivered, resulting in paralysis. The higher up the spinal cord is injured, the greater the likelihood of quadriplegia. As a rule, a spinal cord injury in the C1-C7 (cervical or neck area) of the spine is the most likely to cause paralysis of both the arms and the legs. Brain injury – According to the Centers for Disease Control and Prevention (CDC), traumatic brain injuries (TBI) occur approximately 1.7 million times a year in the United States. A TBI can be mild, moderate or severe. A severe TBI can result in quadriplegia. If the areas of the brain that control the arm and legs muscles are injured, then paralysis may result. Multiple sclerosis – Multiple sclerosis is a disease that affects the nerves in the brain and spinal cord. When a person has multiple sclerosis, his or her immune system mistakenly attacks a substance called myelin, which surrounds nerve fibers and helps with the transmission of nerve signals. Unfortunately, there is currently no cure for quadriplegia. That does not mean that doctors cannot do anything for a patient with quadriplegia. The care and treatment of quadriplegia is aimed first at preventing further injury and then at providing as much mobility as possible. Because a head or spinal injury can worsen quickly, a patient who may have suffered either type of injury must receive medical treatment immediately. Doctors will work to reduce the swelling in the brain and/or spinal cord to prevent additional injury. Once everything has been done to prevent further injury, the patient will begin the long process of rehabilitation and adaptation. This may include the use of mobility devices such as a wheelchair as well as assistive technology to help a patient live an independent and productive life. Technology can now allow some patients with quadriplegia to operate an entire home by voice activation, for example. Although a cure for quadriplegia has yet to be found, researchers are working hard to find one. Specifically, research is being conducted on ways to regenerate cell growth as well as surgical methods aimed at repairing damaged nerves. Some quadriplegic patients may be good candidates for current trials in these areas. Current estimates put the cost of treating a quadriplegia in the first year at between $700,000 and $1 million, depending on the cause and extent of the injury. The lifetime cost of treating quadriplegia is estimated to be over $3 million. While the future looks brighter every day as medical science continues to push for ways to help paralysis victims become mobile once again, the cost of that future will likely be high.